Last year, I purchased an HD webcam for my music studio. 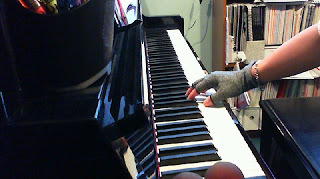 My students, their parents and I have enjoyed how easy it is to take a quick video clip or photo of either a hand position or drilling a troublespot in their music. They get to review it as many times as they need to at home as an unlisted Youtube video. 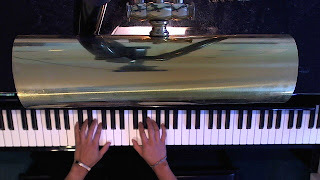 Some of my piano parents really like the overhead camera as it gives them the same view that pianists see when they look at their hands. This year, we are moving full-steam ahead with computer assisted instruction. Thanks to Memory Express and Best Buy, I was able to take advantage of their huge sale on webcams. Webcam #2 is positioned to give that all important profile view. It's great for checking posture and ergonomic movement. Technology in music can be as easy as a $30 HD webcam. Photo by R-M Arca. It took a while for some of today's students to find Webcam #3. I have a few students who need the pedal view. Having multiple camera views for computer assisted music lessons is ideal. Photo by R-M Arca. My beginner piano students were pretty eager to test how well my computer could handle recording from two cameras simultaneously. It turned out all right. I'll have to fiddle around with the audio settings a bit, but at least my students and I are having fun with these toys as we explore the exciting world of music. Once we get a better handle on things, Skype piano coaching can't be too far away.